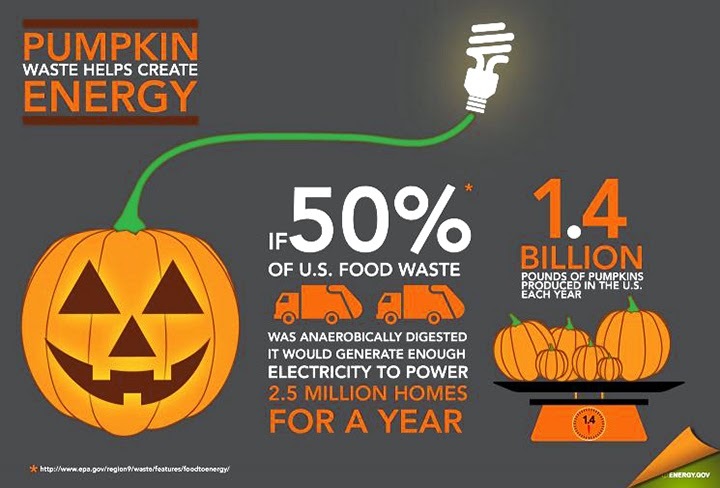 It might not be long until the 1.4 billion pounds of pumpkins we produce annually are nearly as important to our energy security as they are to Halloween! The story is a little different in Oakland, California. Thanks to the pioneering work of the East Bay Municipal Utility District (EBMUD), discarded pumpkins and other food waste are used as a source of renewable electricity. Oakland’s EBMUD collect food waste and uses microbes to convert it into methane gas that is burned to generate electricity. The Energy Department is helping to fund the development of integrated biorefineries, industrial centers dedicated to converting plant material into biofuels and other products. With the passing of Halloween, millions of pounds of pumpkins have turned from seasonal decorations to trash destined for compost heaps or landfills. How is that possible? First, waste haulers gather post-consumer food waste and deliver it to EBMUD’s anaerobic digesters. Inside these giant tanks, bacteria break down the food waste and release methane gas as a byproduct. EBMUD captures this gas and uses it to generate electricity in onsite generators. A ton of food waste provides about 367 m3 of gas, and digesting 100 tons of food wastes five days a week can generate enough electricity to power 1,000 homes. Once the food waste has been digested, the remaining solids make an excellent natural fertilizer, so they can be used to get next year’s pumpkin crop started. Discarded pumpkins and other organic waste material can be used for more than just electricity. The Energy Department is working together with industry to develop and test integrated biorefineries, industrial centers capable of efficiently converting plant material into affordable biofuels, biopower, and other products. These projects are located around the country and use a variety of materials as feedstocks. Two of them, Enerkem in Mississippi and INEOS Bio in Florida, use municipal solid waste as a feedstock, like EBMUD, but use a process called gasification to produce ethanol and electricity. In 2012, INEOS Bio is planning to open the Indian River County Bioenergy Center, which will produce 8,000,000 gallons of ethanol, enough to fill about 232 of the largest railroad tank cars, and 6 megawatts of electricity a year from 300 dry tons of biomass a day, including yard waste and food scraps. In Mississippi, Enerkem is planning a biorefinery on a regional landfill. They plan to convert 300 tons of solid waste a day into ethanol, amounting to 10,000,000 gallons (290 tank cars) of ethanol per year. The Energy Department’s partnership with these companies is helping to remove barriers to commercialization of fuel and power production from municipal solid waste, including yard and food wastes, and so it might not be long until the 1.4 billion pounds of pumpkins we produce annually are nearly as important to our energy security as they are to Halloween!